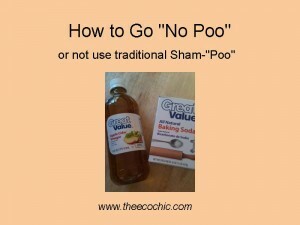 How to Go “No Poo” – You Tell Me Because I’m Clueless! The trick is finding the right combination of the two that will work for your hair style and type. I’ve tried this for 3 days and I’m at a loss. I guess I’m actually going to have to research all the different recipes and combinations because I can’t figure this one out on my own. Day 1: I dissolved a tablespoon of baking soda in about 1 cup of warm water (in a peri bottle I had left unopened from childbirth). When I was showering I squeezed the solution onto my hair trying to pay attention to the roots. Rinse. My hair was actually quite dirty the first day I tried this so I was really nervous that I wouldn’t get it clean. I followed this with a solution of 1 tablespoon apple cider vinegar in about 1 cup of warm water (in an old shampoo bottle) and squeezed that out over my “no poo’d” hair. Rinse. Dry and Style. Results: Ugh, my hair feels dingy and dirty. It was actually quite soft at the ends but the roots felt dirty. Maybe I used too much vinegar. Day 2: After day 1 I really felt defeated already (even though people told me to be patient) and washed with regular shampoo and conditioner to get it back to normal. Day 3-4: I got lazy and kept up this same routine with regular shampoo and conditioner. Day 5: Ok, I’ve finally decided to try “No Poo” again! Today I decided to add slightly more baking soda to the solution and to skip the apple cider vinegar all together. Rinse. Dry. Style. My hair felt squeaky clean in the shower and was more difficult to comb than usual. I could tell that I didn’t use conditioner (which I use 100% of the time just for the soft feel and to untangle my tresses). I dried as normal but could see that I was going to be a hot mess! My hair is incredibly dry and the ends are frizzy. It feels really clean at the roots but the ends are overly dry. I guess I did need the vinegar after all. After a little more research tonight I’m going to wait a day or two to wash until my hair has restored some of the moisture naturally that the baking soda removed. Then I’m going to create a paste (versus a solution) with the baking soda and only apply to the roots. Finally I’m going to use slightly less vinegar and only apply it to the ends of my hair where they get dry the quickest. Will you join me as I continue my experiment? Will you share with me your tips and personal experiences? Join the conversation in the comments section below or on Facebook. Have you made any green resolutions for 2012? Join me by taking the Pledge to Go Green in 2012 and pledge to make one small change each month. More about my hair: I have naturally straight hair with very little body. I typically use a hair straightener to get the style just perfect. That’s about it! OK, about to do a new post on this (Monday) but I found out from my friends at the Aveda Institute yesterday that the baking soda is going to make our color-treated hair more porous (hence the dryness issue – I’m having it too). They recommended to me that we only use baking soda once a week at the most. I am just rinsing my hair now and using the apple cider vinegar. I also use my homemade dry shampoo on the roots if they look greasy. More info on Monday on Conscientious Confusion! Awesome Jennny…thanks! My husbands said “Gross” when I told him what I was doing. I have tried no poo on my daughter, who is 2 and has curly hair quite the opposite of mine. I only wash it a few times a week (like every 3 days or so) and I find that putting the vinegar in a spray bottle works well to distribute evenly and lightly. I also had to come up with a leave in conditioner because her curls need SUPER incredibly large ammounts of moisture…. so I took another spray bottle and filled it with distilled water, then added a generous tablespoon of pure avocado oil and a few drops of lavender essential oil. She loves the way it smells, and I love the fact that it makes her hair so much easier to mannage! Thank you Courtney. I’ll have to try the spray bottle. Wherre did you find the avocado oil? I buy the Avocado oil at our local natural foods store. I think most health food places or specialty grocers would carry it. Enjoy your adventure! Here are two posts I wrote on the subject. I hope they help! Tiffany recently posted..Naturally Fresh Deodorant Review and GIVEAWAY!! Thank you Tiffany. I feel like there are so many options so at least I don’t feel like I’m failing. Emily, thanks for asking – I am doing a post about that on my blog either this weekend or Monday! Calley might also have feedback on her end the next time she goes for a cut! The people who seem to have the most positive experiences doing this have curly, dry, or frizzy hair, none of which are true for me. However, some people also counterintuitively say that this technique also benefits greasy hair. The claim is that when too much of your natural oil is cleaned off, your sebaceous glands detect that there is not enough and will overproduce oil to compensate. That’s what I’m learning. I have normal, straight and color treated hair so I’m having to modify this approach a bit. Hi! I began the “no poo” in 2012 too and just wanted to share some tips I have come across in my hours of research to get this routine right! I have used 1 tbsp baking soda dissolved in a cup of water followed by 1 tbsp apple cider vinegar dissolved in a cup of water as a rinse. The key with the baking soda solution seems to be to really scrub and work it into your hair after you pour it on. Give your scalp an intense massage and go over every part of your scalp, particularly the crown, until your arms are sore. I massage the baking soda into my hair for at least two minutes. My understanding is that using a paste (less water, more baking soda) can be damaging to the hair cuticle and too drying. The solution should feel like water, not a gritty paste. Then I pour the Apple Cider Vinegar solution over my hair and let it sit for two minutes before rinsing out with water. If you have very dry ends, try dipping them in a cup of the ACV rinse first so they get extra conditioning. It is important to cover your whole head with the ACV as it will neutralize the pH of your hair and prevent damage to the acid mantle of the scalp from the alkalinity of the baking soda. It also acts as a conditioner and prevents tangles. If ACV is too moisturizing, you can use white vinegar instead. I just started using the Chagrin Valley shampoo bars. I bought several sample sizes to find which one worked best for me. I am loving the one that works best for my hair. All natural ingredients and a great price. I think the sample size should last me at least 3 months! I still have not found the best way to condition my hair, but I am working on the ACV rinse ratio. I use aloe Vera to maintain the thickness and have a shiny hair. A lot of benefits can get through using this natural plant. Aside from using shampoo and conditioner, put aloe Vera gel after the conditioner and observe the difference after using it.